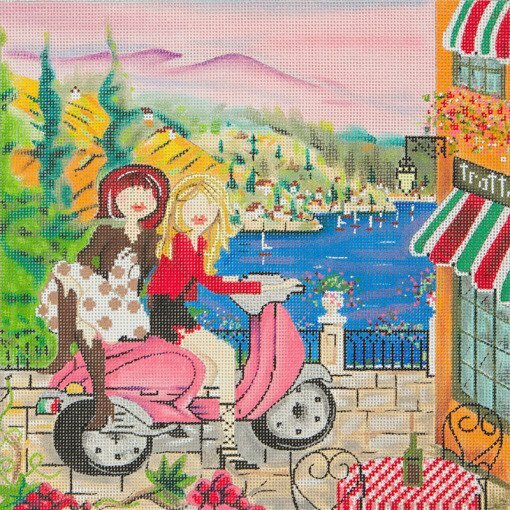 This Girls In Italy needlepoint design is handpainted onto 18 mesh needlepoint canvas. This design is from the studio of Alice Peterson Co.
You can purchase this design as canvas only or with threads. If you select cotton threads we will send DMC embroidery floss; if you select wool , we use Bella Lusso luxury wool fibers; or for silk threads we will send Planet Earth Pepperpot boutique fibers which are single ply for 18 mesh. If you wish to purchase stretcher bars we recommend two pair of size 12". This Girls In Italy contemporary handpainted needlepoint design would be suitable for an intermediate or advanced stitcher.